We ship Worldwide by main express Courier companies: DHL, UPS and TNT and have 24h-48h delivery to most European countries. We are and ship from Spain, inside the European Union, so if you are a European customer do not need to pay any taxes or custom fees. Shipping and delivery of orders is from Mon-Fri. For each type of shipment ElectronicaRC specified limit hour of order reception if you need same day shipping; any order make after after this hour will be ship next day. Please take this information in account when making an order. Correos (International Airmail shipping) do not allow to ship Lipo batteries through his network. So if the order includes any Lipo battery is necessary for the customer to select any of the alternative Shipping methods. •International Air Mail Shipping: 2-5 days delivery. Delivery times given are only indicative and are met in 95% of shipments. Notwithstanding, any kind of delay does not imply or cancel the order or have right to compensation of any type. The shipping cost depends on weight and choosen shipping method. The price is automatically calculated by our website and can be viewed before making payment and finishing the order. 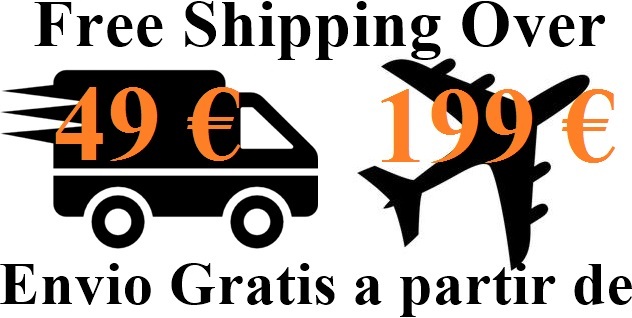 All orders above 199 EUR have free shipping. Optionally customer have aditional shipping methods for 24h or 48h delivery to any point of Europe trought DHL or UPS. Also on this website there are many products that are offered with free shipping. These products and any other products to be included in the same order, will be shipped for free.